Padstow Christmas Festival takes place next week from Thursday 4th to Sunday 7th December and is one of the country’s biggest free food festivals. We are really looking forward to it here at The Old Quay House. Our head chef Ben Bass will be doing a demo which takes place in the Festival Kitchen at 12 noon on the Sunday 7th December so if you are near Padstow please do come and watch. Ben will be making “potted hot smoked salmon with lemon purée and poppy seed bread”. “This is a very simple dish to make but it is delicious and great as a canapé or a quick supper. All the ingredients are easy to source year round, and it doesn’t require any complicated kitchen equipment which is a bonus,” says Ben. 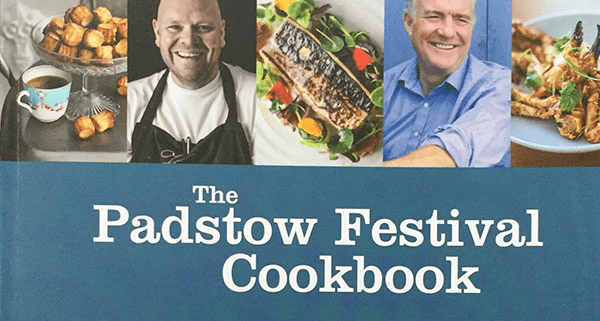 Sticking to the salmon theme, Ben’s recipe for “coriander cured salmon, avocado, fennel and smoked tomato” is featured in the new edition of the Padstow Festival Cookbook. It is one of 46 fantastic recipes contributed by chefs taking part in this year’s festival or who have done so previously. If you’re keen to get hold of a copy of the book, they are now on sale. You will be able to buy one in Padstow next week or via the Padstow TIC website.